As UJA Federation of Greater Toronto celebrates 100 years of providing philanthropy, leadership and service to both the Toronto and the global Jewish communities, we reflect on the past century with great pride. Content and photos, courtesy of Ontario Jewish Archives, Blankenstein Family Heritage Centre. 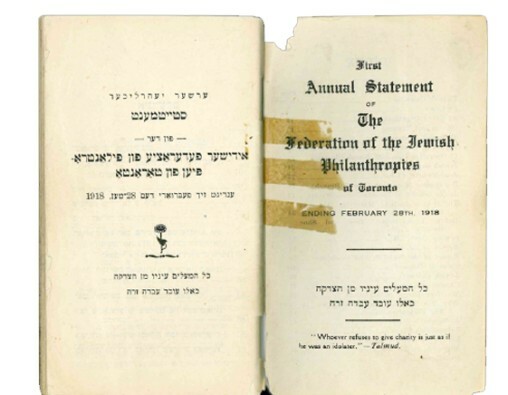 In 1917, community leaders Ida Siegel, Edmund Scheuer, and Abraham Cohen establish the Federation of Jewish Philanthropies of Toronto (FJPT), which coincides with the signing of the Balfour Declaration. The founding of the FJPT is prompted by a monetary crisis brought on by pre-war immigration and a recession. The leaders recognize the need to bring the community together in adopting a federation model that has been spearheaded by other American cities. The FJPT will coordinate the fund raising and distribution efforts of the many small Jewish social welfare agencies competing for limited resources. A total of ten agencies, mostly led by women, affiliate initially. The first campaign is chaired by Edmund Scheuer with an ambitious target of $30,000. A total of $25,300 is raised. 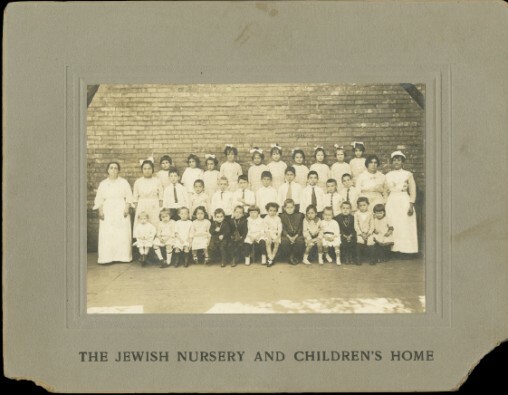 Jewish Nursery and Children’s Home, which would share space with the FJPT, 218 Simcoe Street, ca. 1916. 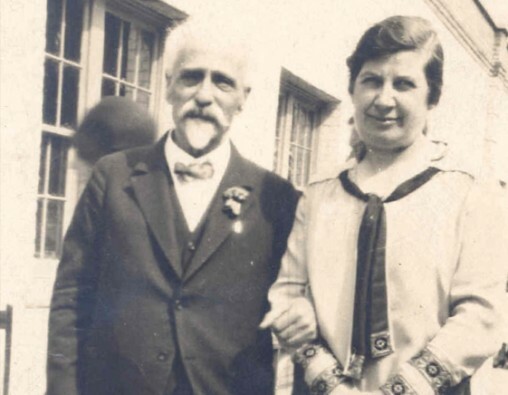 Edmund Scheuer and Ida Siegel, two of the founders of the Federation of Jewish Philanthropies of Toronto, ca. 1927. The Federation of Jewish Philanthropies first annual report, 1918. Toronto’s Jewish population has nearly doubled in ten years to 31,709. 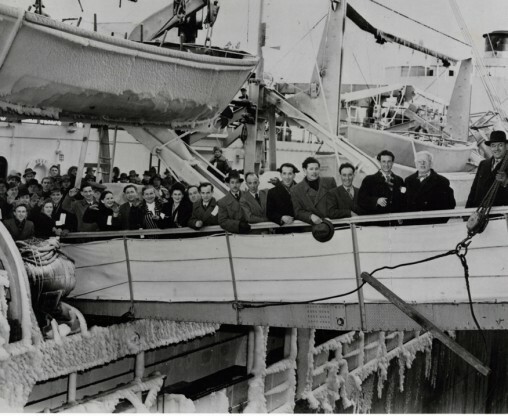 The first decade of the FJPT’s existence witnesses a mass migration of Jewish refugees from Eastern Europe, which presents new challenges for the fledgling organization. In addition, Toronto is reeling from the Influenza epidemic. In response, the core of the relief work performed by the Jewish agencies at this time focuses on health care and hygiene, family welfare, and children’s services. 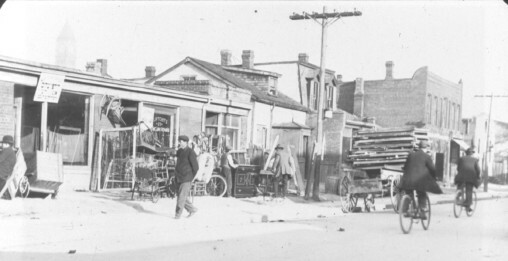 In 1922, the FJPT moves into the former Associated Hebrew Charities building at 218 Simcoe Street, which also houses the Jewish orphanage. The FJPT is situated in between Toronto’s St. John’s Ward, a large receiving area for recently-arrived Jewish immigrants, and Kensington Market, which will soon become home to tens of thousands of Jewish residents. Teraulay St. in The Ward, ca. 1910. 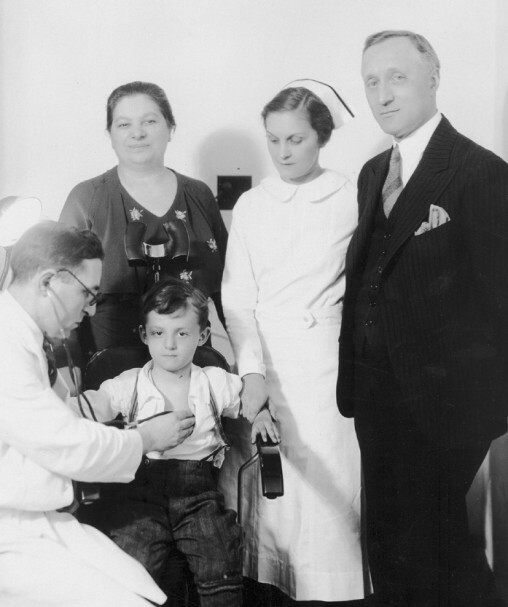 Dr. Simon Fines examining boy at old Mount Sinai Hospital, ca. 1930. Dorothy Dworkin, an unknown nurse, and Ephraim Frederick Singer, President, are standing behind them from left to right. Toronto’s Jewish population is 45,305, the largest ethnic minority in the city following the Irish. Eighty percent of the population lives in and around Kensington Market. In 1928, on the eve of the stock market crash and the Great Depression, the FJPT launches its 13th annual campaign. Markets plummet, but over $140,000 is raised despite the difficult conditions faced by many. Times are tough when in 1933, principal Rabbi Treiger of the Brunswick Talmud Torah informs his board that the school’s teachers have not been paid in 24 weeks and are threatening to quit. When the school is forced to temporarily close in 1935, an emergency campaign is launched by Samuel Godfrey. With the help of a professional fundraiser from New York City, the school is saved and so begins the professionalization of philanthropic work. The FJPT shifts its focus from just supplying financial relief to implementing preventive measures and case work is introduced in an effort to encourage social and material independence. 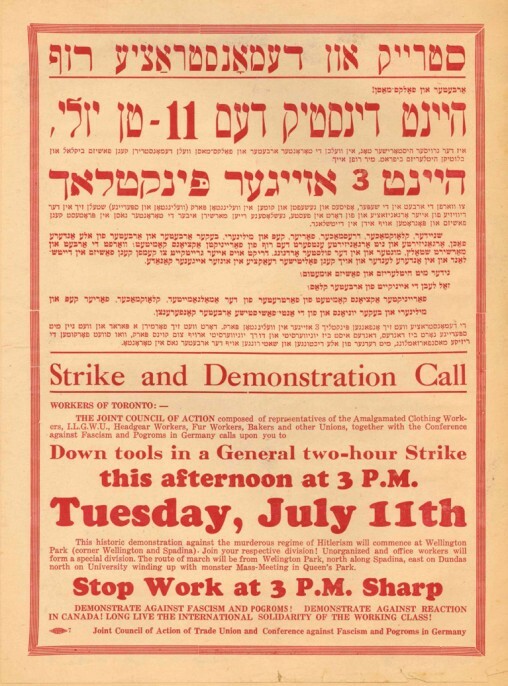 The 1930s proves to be a period of labour unrest as Toronto’s Jewish-dominated garment unions repeatedly strike for more favourable conditions. As the decade unfolds, the community is becoming increasingly aware of the situation in Europe as the Second World War looms on the horizon. Stop-work broadside featuring information about a march and demonstration at Queen’s Park in protest of the “pogroms of German Jews”, 1933. 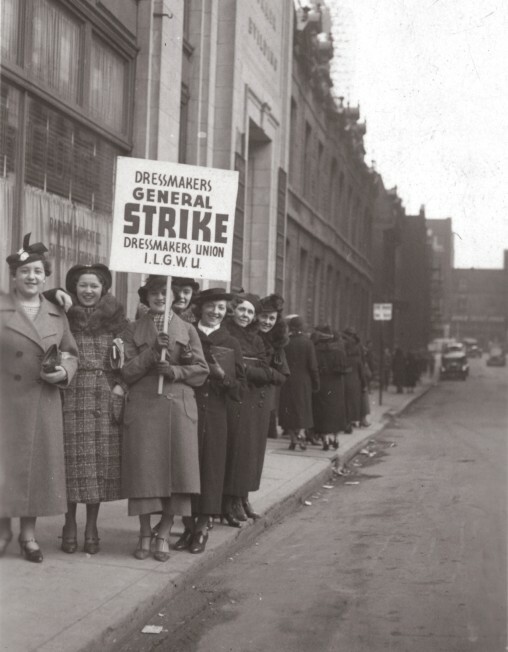 9 Dressmakers General Strike, Dressmakers Union of the I.L.G.W.U, 1931. A total of 500 dressmakers went out on strike for higher wages and shorter hours. They were unsuccessful. Jewish population of Toronto is 49,046, only a very slight rise due to Canada’s severe immigration restrictions. The success of the Brunswick Talmud Torah campaign inspires the executive director of the FJPT, Martin Cohn, to adopt a similar fundraising approach. Cohn is convinced that a Welfare Fund model will allow for better long-term planning and oversight and help mobilize the Toronto Jewish Community. Ben Sadowski, Arthur Cohen, Samuel Godfrey, and J. I Oelbaum form a Committee of Five while Florence Hutner becomes the new Fund’s publicity director in 1938 and its executive director in the early 1940s. 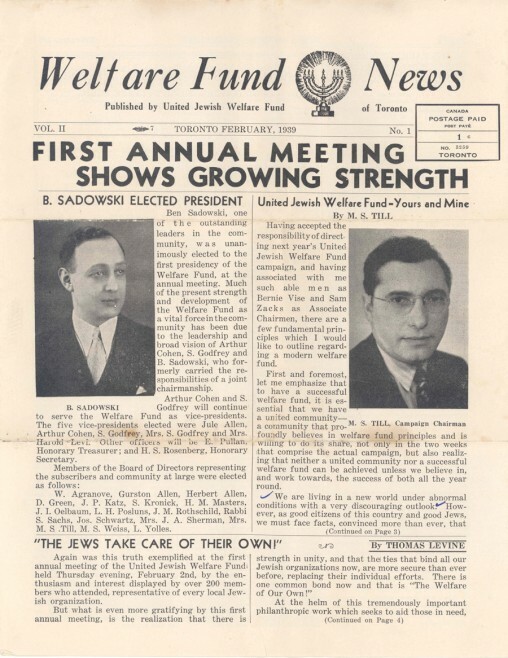 The United Jewish Welfare Fund (UJWF) is formalized in 1938, changing the course of organizational history in Jewish Toronto. The rise of Nazi Germany and the Second World War takes its toll on Jewish Torontonians. Close to 17,000 Jewish Canadians enlist (the largest ethnic group), serving overseas and on the home front. Many fear for their loved ones as news of Jewish persecution under Nazi rule filters through to the community in Toronto. The end of the Second World War presents new challenges. The UJWF responds to the atrocities in Europe and the plight of survivors of the Holocaust with a major shift in their allocations. Between 1945 and 1947, the Canadian Jewish Congress (including the United Jewish Refugee and War Relief Agencies) receives a total of $1,105,000 from the UJWF, mostly directed toward refugee immigration and settlement. Jewish immigrants on board the General Sturgis at Halifax, Nova Scotia, 6 Feb. 1948. The Welfare Fund News from 1939 declaring Ben Sadowski as President and Morris Till as Campaign Chairman for the following year. 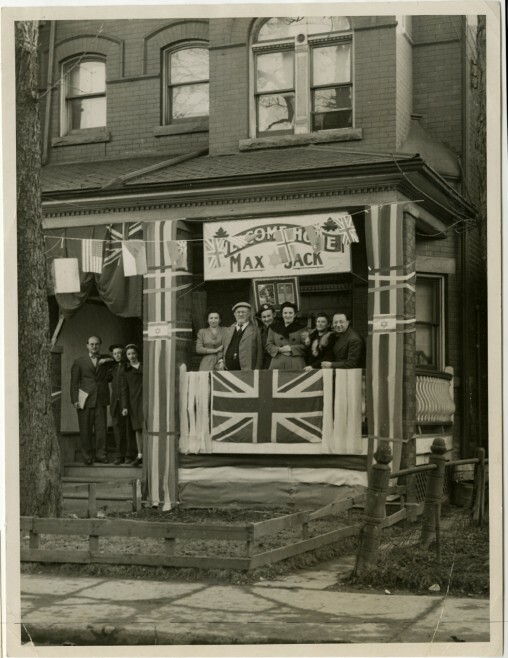 The Tepperman family gathered at their 55 Oxford St. home for a special welcome for returning Second World War veterans, Jack & Max Tepperman, 1945. Nathan Phillips is elected first Jewish Mayor of Toronto. It’s 1948 and the State of Israel is born. The Jewish community of Toronto rejoices! Following the establishment of the State of Israel, the UJWF combines its annual fundraising campaign with the Combined Palestine Appeal (United Israel Appeal), operated locally by the Toronto Zionist Council. The new wide-reaching campaign is named the United Jewish Appeal (UJA), benefitting both local and overseas needs in one fund. The local community is growing and in need of new infrastructure. The UJWF assumes the responsibility for the construction or expansion of several important institutions including the new Jewish Home for the Aged, the New Mount Sinai Hospital, the Bloor and Spadina YM-YWHA, and Associated Hebrew Schools. The Bureau of Jewish Education is established in 1949. 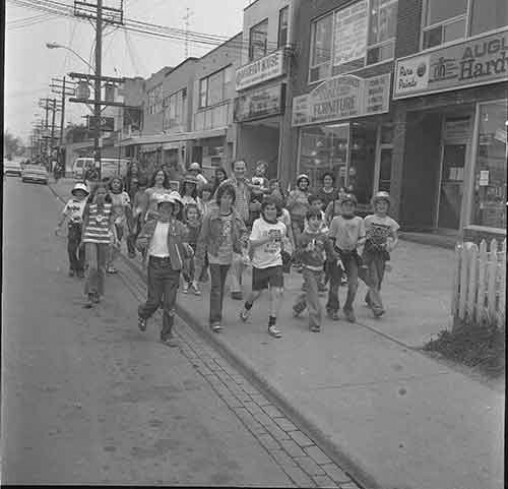 The transition out of Kensington market begins as second generation Jewish Torontonians and first generation Holocaust survivors plant roots in Clanton Park and Armour Heights. The suburbs are born. Parade in commemoration of the founding of the State of Israel, 16 May 1948. Photo by Dr. John E. Ackerman. The parade route travelled down College St. and ended at Maple Leaf Gardens. 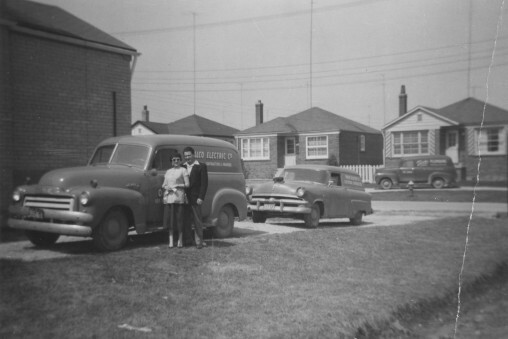 Abe and Freda Blankenstein on St. Germain Ave., Toronto, 1956. 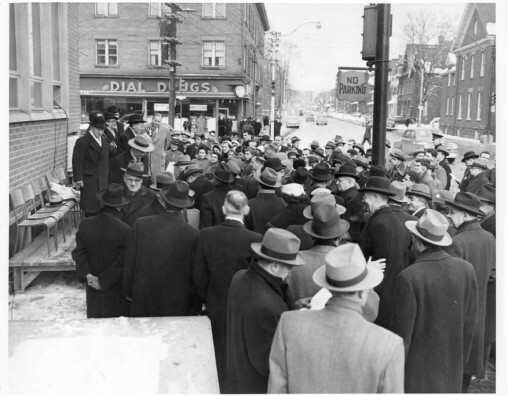 Bloor YM-YWHA cornerstone dedication, 3 February 1953. 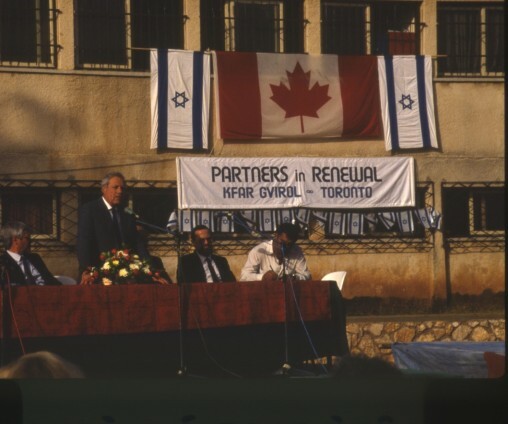 The public name of the Welfare Fund is changed to the Toronto Jewish Congress in 1976 after a negotiation between the UJWF and the Canadian Jewish Congress, Central Region that sees the UJWF take responsibility for many local services previously shared with the CJC. The decade of peace and love also ushers in a period of heightened Jewish activism. 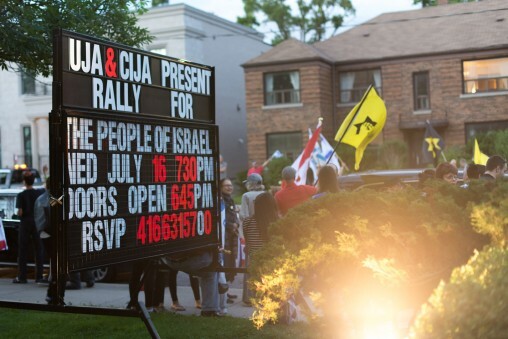 Concerns about human and civil rights in Canada, the rise of neo-Nazism, and support for Israel receive increased attention from Jewish Torontonians. 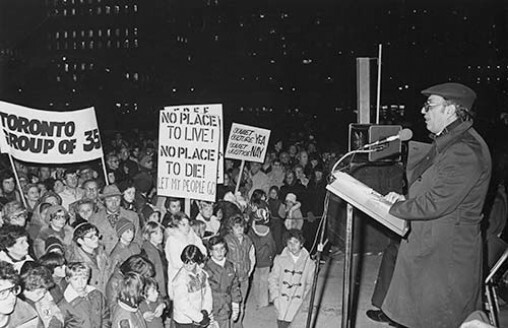 The Allan Gardens Riot occurs in 1965, when neo-Nazi William John Beattie attempts to hold an open-air speech in Toronto’s east end park. It is derailed by Jewish community members, including Holocaust survivors and Jewish vigilante groups. In 1967, in response to the Six-Day War, UJA launches its first Israel Emergency Campaign raising the highest amount of money to-that-date by the UJA. Study missions to Israel become an annual event that allows the UJA leadership to see the outcome of their work in Israel and the challenges that lay ahead. The immigration, absorption and resettlement of Middle Eastern and North African Jews becomes urgent as the UJWF and its partner agencies assist thousands fleeing persecution and poverty with safe passage to Israel and Canada. 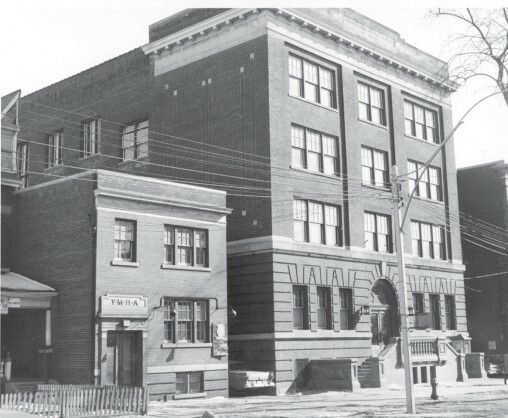 Back at home, the community continues its move northward into Bathurst Manor, prompting the need for new cultural and recreational services and in 1958, the groundbreaking of the North YM-YWHA at 4588 Bathurst Street takes place with the building completed in 1961. Third Mission to Israel, 1959. 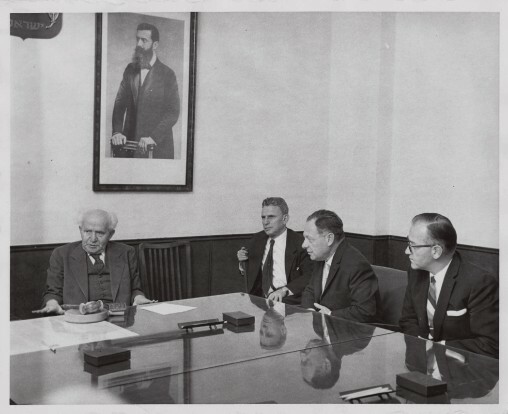 Pictured is Prime Minister David Ben-Gurion meeting with Toronto mission participants. Pictured second from right is Arthur Minden. 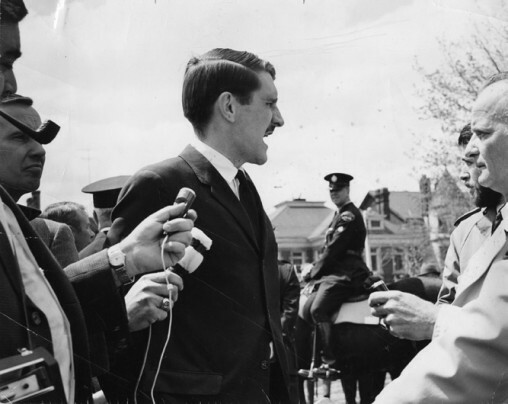 William John Beattie at Allan Gardens, three years after the Allan Gardens Riot, 5 May 1968. 1973 - Following the Yom Kippur War the UJA raises $8,500,000, the largest amount ever raised with the exception of the 1967 emergency campaign. 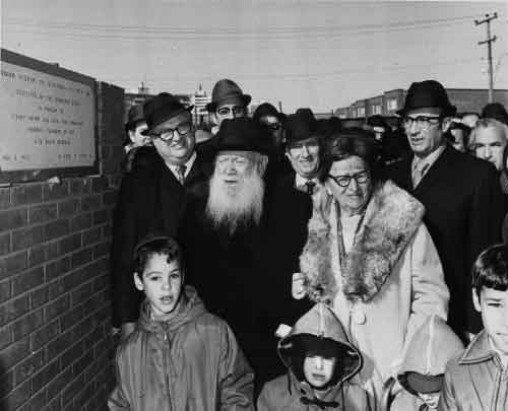 In 1970, the UJWF commissions a sweeping study on Jewish education in Toronto; the first of its kind since the formation of the Bureau of Jewish Education in 1949. The study makes a series of recommendations on financing the Jewish school system, recruiting and training teachers, standards for curriculum, and the structure of the BJE. The first Walk with Israel is organized in May 1970 as the “Walk for Jewish Survival”. The original walk is 22 miles (35 km) long and funds raised go to the UJA-Israel Special Fund. 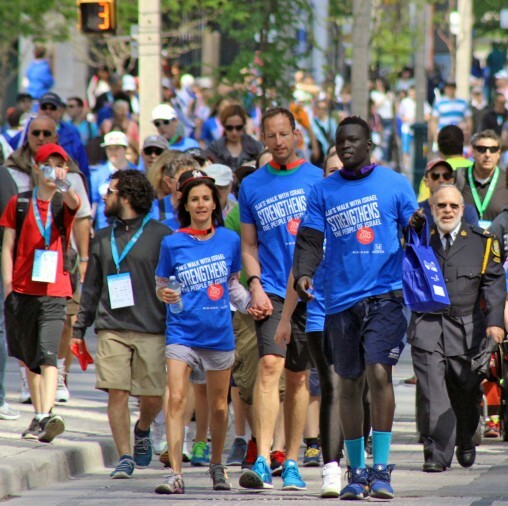 The walk will become the largest single community event for Jewish Toronto with money always designated for Israel. 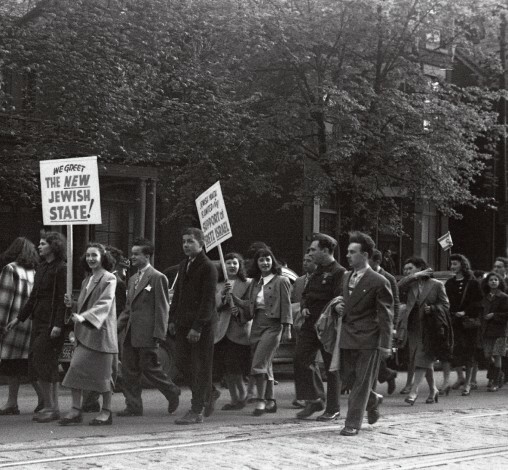 The Soviet Jewry movement is founded as Jewish Torontonians unite in opposition to the widespread persecution and unlawful detention of Soviet Jews in Russia and the refusal of exit visas for those wishing to emigrate. Thousands join in public protests and demonstrations, letter writing campaigns, political lobbying and other advocacy efforts, headed by the CJC’s Committee for Soviet Jewry. “Let My People Go” becomes the mantra for a new generation. Simchat Torah rally for Soviet Jewry at Nathan Phillips Square, 11 Oct. 1976. Ontario Jewish Archives, Blankenstein Family Heritage Centre, fonds 17, series 3-5, file 62. The King of Kensington, Al Waxman, with children at the UJA Walkathon, 30 May 1976. Ontario Jewish Archives, Blankenstein Family Heritage Centre, fonds 67, series 17-1-2, file 2. Jewish population of Toronto reaches 123,735. For the first time, Toronto’s Jewish population is higher than Montreal due to the mass migration following the election of the Parti Quebecois in 1976. 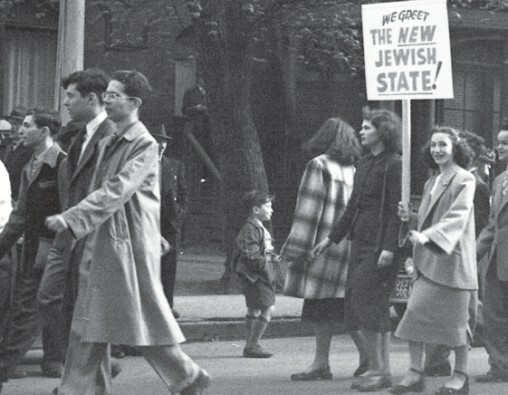 The success of the Soviet Jewry movement means an influx of Russian immigrants to Toronto. The Toronto Jewish Congress (TJC-formerly UJWF) works with its partner agencies to settle and integrate these new immigrants into the existing community. Organizations like the Jewish Immigrant Aid Service, Jewish Family and Child Service, and Jewish Vocational Service provide much-needed assistance to the Soviet émigrés. Similarly, in 1979, the Social Planning Committee of the TJC works with 26 organizations, agencies and institutions over eight months to coordinate services for refugees from Southeast Asia following the Vietnam War. In 1979, the TJC “adopts” Beit Dagan near Tel Aviv as its first Project Renewal community in need of revitalization and much needed services and facilities. The TJC then twins with Kfar Gvirol in 1985. 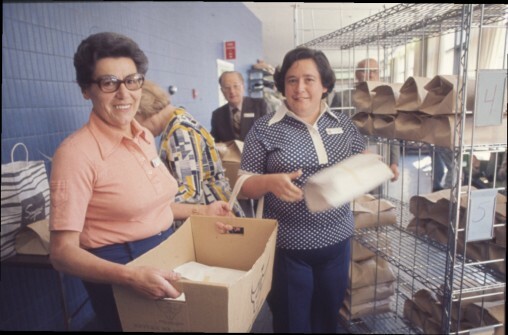 The 1980s also begins a new chapter of inclusivity as the TJC addresses the unique needs of the elderly, non-married persons, single parents, and adults and children with disabilities. Looking overseas and spurred on by the need to support the rescue, migration, and rehabilitation of Ethiopian Jews to Israel, the 1987 campaign raises the highest amount of funds since the 1973 Yom Kippur War; a remarkable feat during a year of relative peace and calm. Kosher Meals on Wheels, ca. 1979. The Meals on Wheels program is now run by Circle of Care. Russian immigrants being received at the airport by Maurice Benzacar of JIAS, ca. 1978. 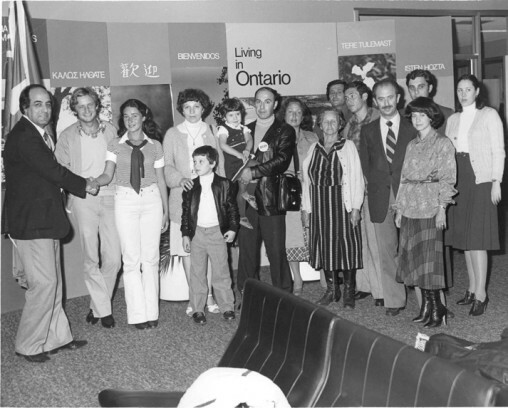 Members of Toronto’s Jewish community in Kfar Gvirol, 1985. The Toronto Jewish Congress changes its public name to the Jewish Federation of Greater Toronto (JFGT). In Israel, the TJC continues its support of Project Renewal by twinning with its third town in Israel – Eilat-Eilot – which will greatly benefit from the money and support of the Toronto Jewish community. At home, the perceived erosion of Jewish identity and affiliation amongst Toronto Jewish youth becomes a priority for the TJC who focus on funding a variety of programs aimed at helping young people learn, feel and act "Jewishly”. These include Israel experiences like Project Otzma, Jewish services on university campuses, and Jewish programming at summer camps. 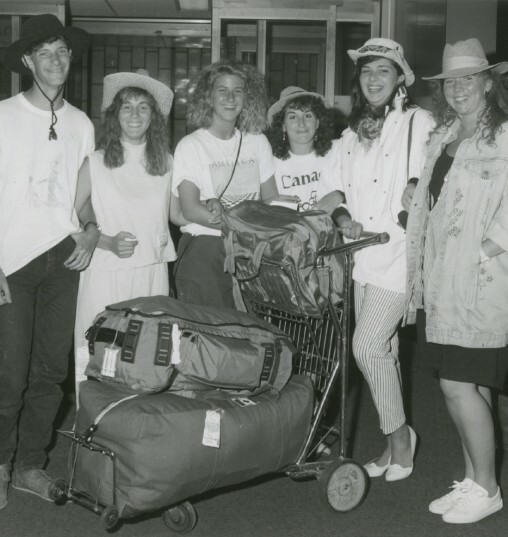 Project Otzma participants head to Israel for an 11-month immersive program that includes a stay in Eilat, 1988. 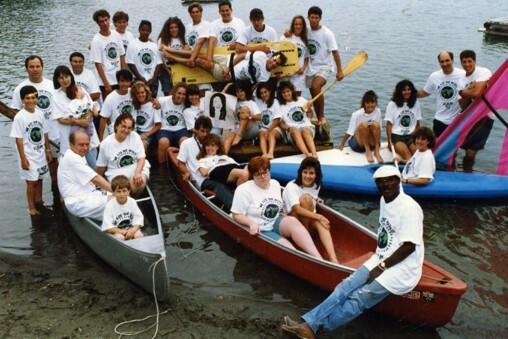 Camp Solelim at the waterfront, 1990. Jewish Federation of Greater Toronto changes its name to UJA Federation of Greater Toronto. By this date it has over 30 beneficiary and affiliated agencies, 49 affiliated schools and five Federation departments. The newly amalgamated City of Toronto elects Mel Lastman, former mayor of North York, as its third Jewish mayor in 1998. The period that follows sees dramatic growth for both the city of Toronto and its Jewish community. More and more families are moving into Thornhill, including over 3,900 Israelis. In 2004, the UJA Federation of Greater Toronto (formerly JFGT) returns to its responsibility of providing new infrastructure by unveiling Canada’s largest non-profit community development project. The Tomorrow Campaign plans to invest an unprecedented $250 million in three areas of the GTA from downtown Toronto to Bathurst and Sheppard to York Region. The years 2003 and 2004 also see the reopening of the Miles Nadal JCC and the Wolfond Centre for Jewish Campus Life at the University of Toronto. the world through programs such as advocacy training for young people countering the rise of antisemitism and the BDS movement on university campuses. 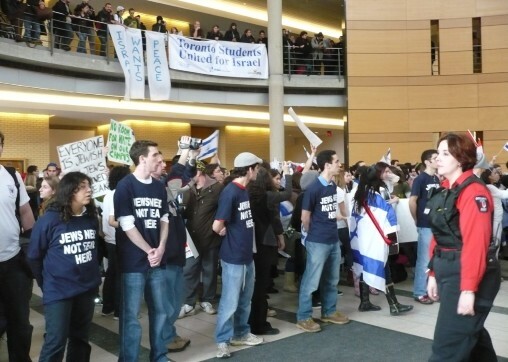 Counter-protest by Jewish students at York University in 2009. 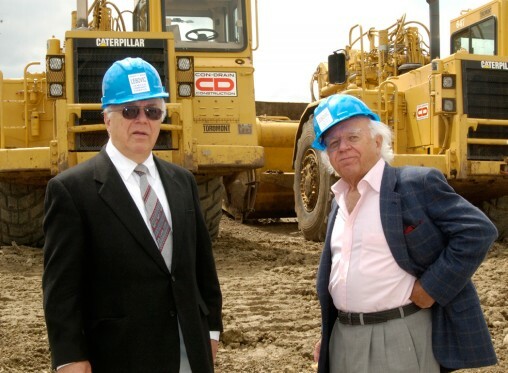 Joseph and Wolf Lebovic on the grounds of the new Lebovic Campus, 2005. 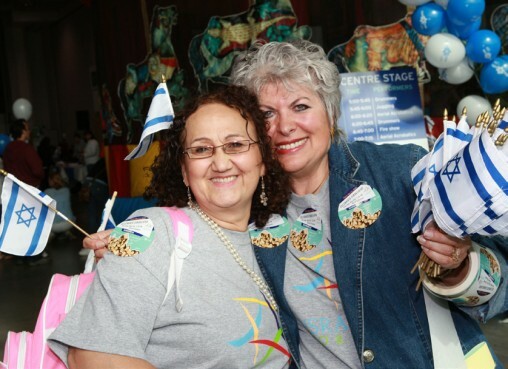 Volunteers at UJA Federation’s Israel@50 Festival, 1998. The Joseph and Wolf Lebovic Jewish Community Campus, home of the Schwartz/Reisman Centre, opens on Bathurst Street north of Rutherford. In the decade leading up to this, our centennial year, the UJA Federation continues to provide the leadership and support for the community in the spirit that it was founded 100 years ago. Our job is far from over. We have returned to our roots: caring for our most vulnerable; fighting against antisemitism; advocating on behalf of all Canadians; building the infrastructure needed by the community; supporting the vibrancy and diversity of Jewish arts, culture and heritage; developing the capacity of our agencies; ensuring that every Jewish child who wants a Jewish education is afforded one; and engaging the next generation of leaders. The past 100 years of UJA Federation has created a solid foundation to build upon for the future. Let us be collectively proud of where we’ve been and the opportunities that the future holds for our community. 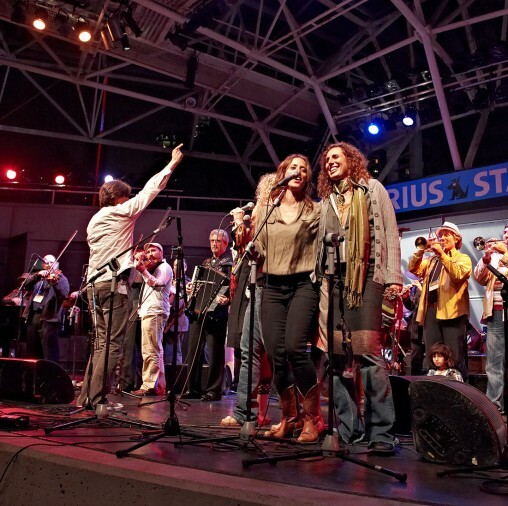 Ashkenaz Festival finale. Photo © David Kaufman, 2010.